Download Whatsapp for PC - Windows 7 8 XP for Free : How to Use Whatsapp in PC for Free. Whatsapp is the most popular messaging app with over 600 million active users.Whatsapp is only available for smart phone users. There is no official release of whatsapp to PC users. So here we are sharing the trick for using whatsapp on your Windows 7 or 8 PC for Free. Install whatsapp on your PC and chat with your friends for Free. 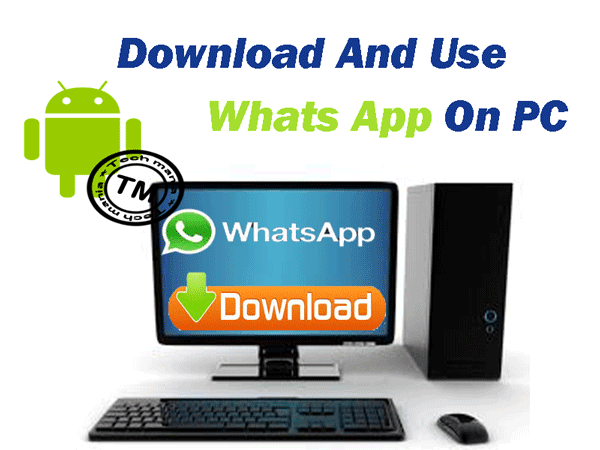 Follow the below steps to install whatsapp on your Windows PC. Whatsapp is the most used popular instant messaging app using which one can chat with friends share pictures, share videos and send voice messages. It is reported that whatsapp is going to introduce voice calls for its users for free. Whatsapp is free to use for the first year and then it charges Rupees 55 from the second year. Is it possible to use whatsapp on PC?? The answer is YES. You can download whatsapp on your computer by using android emulator ( A software which allows you to install android application on your PC ). So you need to have android emulator installed on your computer. There are many types of android emulators but the best one is Bluestacks. So may reported that bluestacks has some installation errors and needs high graphics. If you are also facing the same problem you can install the alternatives to bluestacks like YOUWAVE or ANDY. First you should have Bluestacks installed on your PC. Is you have not installed it you can download it from the above given link. After download is completed install in on your PC. After downloading Bluestacks launch it. You can Search for Whatsapp in the search panel. and Click on Install. Your download begins, wait till the download ends. Now you can see the downloaded apps in My apps panel. Click on the Whatsapp icon and launch it..
Download Youwave for your PC using the link given above. After installation run You wave you should find a screen similar to the one showed below. Click on the button on the top right corner. Whatsapp is installed and is ready to be used. For the first Time use you need to verify your mobile number. You will receive an unique code and just type this code in the box and your number is verified. Add contacts to your whatsapp and chat with your friends. If you have any doubts or installation errors in installing whatsapp on PC you can comment below.